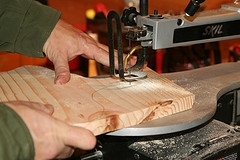 The scrollsaw is a key tool for most woodcrafters. Following the pointers below ill help you master it. Position Your Pattern To concentrate on your scrollsaw technique, put a clear pattern on your wood piece to reduce any distractions. You can copy the outline onto the piece with transfer paper and apply the pattern with rubber cement, spray adhesive, or repositionable spray glue. Joanne recommends removing the dust from your wood piece, then spraying the pattern -- not the wood -- with repositionable glue. (She uses Ridlen All-Purpose Glue.) Spray lightly; if your pattern becomes transparent, you've applied too much glue. Once you've transferred your pattern, try cutting multiple shapes from 1/8" stock. Stack 4 to 6 wood pieces that are slightly larger than the shape you plan to cut. Wrap masking tape around the outside edges of the stack, overlapping the tape ends firmly. Then once you've cut the wood pieces, simply remove the tape. Scrollsaw Tips and Techniques Make Blades Your Business After extensively testing all blade sizes on 1/8" wood, Joanne finds she prefers a #3 double-tooth blade. Blade sizes #4 to #6 work best for 1" stock. A double-tooth blade will produce less chip-out on your wood piece, and will last longer than other blades. To install your blade, make sure the teeth face you and point downward. A blade installed backwards won't cut wood, and an upside-down blade will pick your wood up off the table bed and slap it back down again. You'll notice sawdust on the top surface of your wood piece, not on the bottom, if the blade is upside down. For proper blade tension, insert the blade and turn the tension knob three-quarters of a turn past the point of resistance. A blade that's too loose won't cut a straight pattern line, and a blade hat's too tight will break and possibly damage your saw. If you're right-handed, you'll probably be more comfortable cutting your wood pieces with the largest portion of your piece to the right of your blade. Left-handers should work with the largest part of the wood piece on the left side of the blade. Don't put your hands at the edge of your wood piece. Position them an inch away from either side of the blade to control the wood movement. Keep your fingers at least four inches away from the front of the scrollsaw blade. Imagine that you're driving a car. You know you're headed into a sharp turn, and you reposition your hands in preparation. The same thing applies to the scrollsaw. "Think ahead," says Joanne. "Unless I'm sawing in a straight line," she notes, "my hands are constantly moving around the wood to better position myself for the turns." Watch your hand movements. If you find yourself turning your body to control the movements of the wood, stop and reposition yourself. If you notice when you turn that your entire arm is in front of the blade, stop! Always stand square in front of the machine for best control. Once you're aware of your hand movements, you can cut anything. my students have a tendency to stop the motor (especially when working with a foot switch) when going into a tight turn," Joanne confirms. "This causes the wood to pick up and smash back down on the table." Keep your motor going! And listen to your machine. You should not hear any sawing noise when you make a 90-degree turn. Make the turn by putting your finger fairly close to the blade to allow the wood piece to "pivot" around the blade. An inch away from the blade is close enough. When you're trying to cut out a circle, keep the feeding speed constant. If you continually stop and start as you make the turn, the finished edge will be choppy. If you have any doubt to how and what types of scroll is suitable for me to get a perfect output. Well, here you will find the best scroll saw reviews.And we will guide you to buy the best one for you. Thanks for sharing your experiences. I found a lot of useful information here. I love this tool. It is the most essential tool for wood worker. 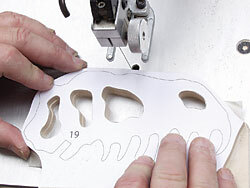 scroll saw is used to cut sawing small details. with it you can create works of art. but its drawback is not cut large pieces of wood. either you have to change saw blades. This tools can also be used in handicrafts and other related stuffs. Very useful indeed. Thanks for information! Lighting is also important. Good lighting will allow you see the lines better and give you the cleanest possible cut. You can purchase lights separately that can be mounted directly onto the scroll saw. Wow, amazing tips on scroll sawing and I have to agree that it is equally important to have a well-lighted room when working on tools like scroll saw and drum sanders. Many people cut scroll saw projects for selling at craft fairs and shows. Some more intricate fretwork patterns and portraits can take a great many hours of cutting to complete. In order to make more effective use of your time and make your hobby profitable, you can use stack cutting to cut multiples of a pattern at once. This is extremely helpful - thanks for sharing! I always have issues working on patterns so I stopped making these altogether. I'll try to use your tips so hopefully that'll sort some of my issues. This article deserves appreciation and I have learnt a lot of information from this write-up. One thing to mention that as a new wood worker, I didn’t know where to stand but I felt comfort standing in front of the blade; it worked great. However, I am trying to buy a drum sander for my new and small wood shop. I found some sanders at this site and not sure which one to pick. Any assistance will be appreciated. Thanks.